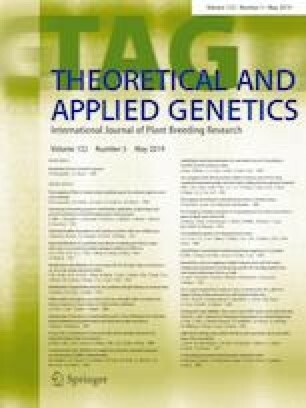 CRISPR/Cas9-mediated genome editing reveals differences in the contribution of INDEHISCENT homologues to pod shatter resistance in Brassica napus L.
The INDEHISCENT (IND) and ALCATRAZ (ALC) gene homologues have been reported to be essential for dehiscence of fruits in Brassica species. But their functions for pod shatter resistance in Brassica napus, an important oil crops, are not well understood. Here, we assessed the functions of these two genes in rapeseed using CRISPR/Cas9 technology. The induced mutations were stably transmitted to successive generations, and a variety of homozygous mutants with loss-of-function alleles of the target genes were obtained for phenotyping. The results showed that the function of BnIND gene is essential for pod shatter and highly conserved in Brassica species, whereas the BnALC gene appears to have limited potential for rapeseed shatter resistance. The homoeologous copies of the BnIND gene have partially redundant roles in rapeseed pod shatter, with BnA03.IND exhibiting higher contributions than BnC03.IND. Analysis of data obtained from the gene expression and sequence variations of gene copies revealed that cis-regulatory divergences alter gene expression and underlie the functional differentiation of BnIND homologues. Collectively, our results generate valuable resources for rapeseed breeding programs, and more importantly provide a strategy to improve polyploid crops. Communicated by Maria Laura Federico. The online version of this article ( https://doi.org/10.1007/s00122-019-03341-0) contains supplementary material, which is available to authorized users. We thank Prof. Yaoguang Liu (South China Agriculture University) for kindly providing the sgRNA-Cas9 plant expression vectors. This study was supported by Grants 2015CB150202 from the National Key Basic Research Program of China, the National Natural Science Foundation of China (31371240, 31671279) and the Fundamental Research Funds for the Central Universities (Program No. 2662015PY172). FC conceived and designed the experiments. ZY, CS, HL and YY performed the experiments. FC, ZY, CS and AO wrote the manuscript. ZY and CS analyzed the bioinformatics.